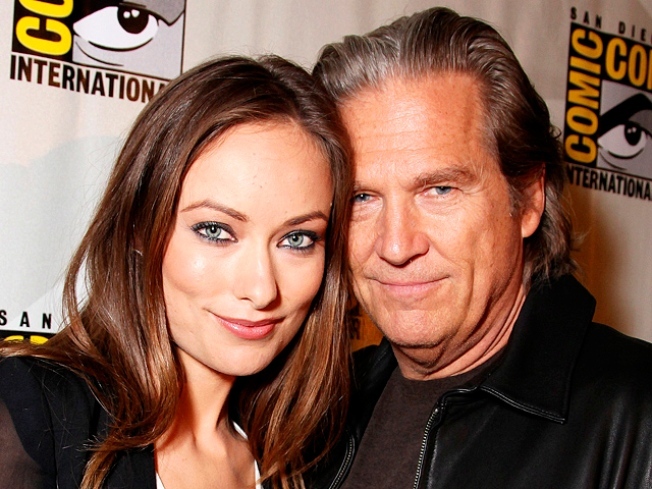 Olivia Wilde and Jeff Bridges at Disney's "TRON: Legacy" at 2010 Comic-Con on July 22, 2010 at the San Diego Convention Center in San Diego, California. My, how Comic-Con has grown. No longer a refuge for fanboys and geeks, the San Dieo pop culture extravaganza drew some of the biggest stars on the planet on its opening night Thursday, including Oscar winner Jeff Bridges, action stars Bruce Willis and Sylvester Stallone, funnymen Will Ferrell and Seth Rogen and even Hollywood's ultimate power couple, Angelina Jolie and Brad Pitt. Jolie regaled fans with stories of performing her own stunts in the new spy-thriller “Salt,” revealing that as she dived through a doorway with a gun in filming one scene she accidentally sliced open part of her face above her nose. “I was bleeding and I have a little scar now,” Jolie told a packed audience at the San Diego Convention Center at Comic-Con 2010. Dressed in a black leather jacket, Jolie returned to the annual convention for the first time in more than 7 years, and joined her "Salt" co-star Liev Schrieber and director Phillip Noyce for the movie’s panel. Jolie wanted to do every stunt in the film, Noyce said. That wasn’t quite the same situation with Schrieber, who openly copped to not performing every stunt. “Am I going to bump my head or face in any way is another thing I think about?” he said to laughter in the audience. Jolie said she decided to do the film, which opens Friday, because "Salt" was “one of the smarter scripts" she’d read, and it wasn’t another fantasy action film. Even Jolie's other half made an appearance of sorts when Tina Fey carried a life-size cardboard cutout of Brad Pitt onstage for the "Megamind" superhero flick panel, which also featured Will Ferrell and Jonah Hill. Asked to name his real-life villian, Hill reportedly name-checked Mel Gibson's ex-girlfriend Oksana Grigorieva. "I just want to come out and officially support Mel," Hill joked.